Both sexes: Streaky brown and black upper parts. Paler under parts. The Skylark is our most common lark and is a plump-bellied bird with a crest, which is not always visible, and is slightly smaller than a Starling. The upperparts are brown with heavy black streaks. The underparts are buff to white and the breast is streaked with black. The outer tail feathers are white. The legs are yellowish-brown and the bill is horn coloured. Juveniles appear scaly owing to pale fringes to most of the feathers of the wings, back and mantle. The Skylark is renowned for its song flight. The male bird rises vertically from the ground high in to the air where it remains stationary for several minutes on fluttering wings before parachuting back down to the ground. All the time it is in the air the bird continuously sings its liquid warbling song. 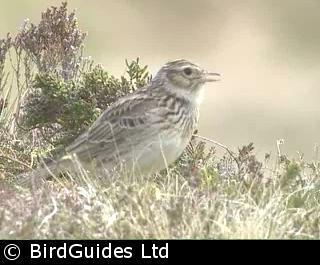 Meadow Pipits and Tree Pipits also parachute, but Skylarks always land on the ground and never in trees or bushes. The Skylark feeds mainly on seed and grain, but also insects. 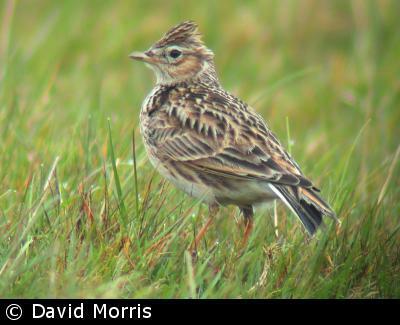 Skylarks breed on meadows, salt marshes, heaths and farmland. The nest is a cup on the ground made from grass and hair. The smooth, glossy eggs are greyish-white with heavy brown and olive spots, and about 23 mm by 17 mm. Incubation is the shortest of any British breeding species and is performed by the female only. The young are fed by both parents. British birds are mainly resident though birds breeding in upland areas and northern Scotland often move to lower altitudes for the winter. The resident bird population is sometimes boosted in the winter by birds from NE Europe. In recent times the Skylark population has plummeted so that today the population is about one-third what it was 30 years ago. The decline is most likely caused by the move to winter sowing of cereals, which deters late-season nesting attempts and may reduce winter survival because there is less stubble, such as barley and wheat, and also the use of pesticides, which kills the insects needed to feed the young. Consequently, it is on the Red List as a bird of high conservation concern. However, some farms are now leaving areas of bare unsown patches in their fields to help Skylarks find food to feed their young.